Dan and Dave's first book reveals over a dozen conceptual palming techniques designed to inspire new ways of thinking about the age-old practice of holding out. Highlights include a method for replacing a bottom palmed card to the top of the deck, a switch loading a palmed card beneath the top card in the action of turning it over, a variation of the Miller Cascade Control that allows for the card to be palmed and a streamlined approach for executing the Diagonal Palm Shift from a peek.What is palming? Basically, it's the techniques magicians and gamblers use to secretly remove cards from the pack into hidden positions in the hands. Gamblers refer to it as holding out. In fact, a card can be palmed from any location in the deck into pretty much any palm position without your spectators ever suspecting. As a result, these cards can be surreptitiously placed either back on top, bottom, or anywhere you conceive (your pocket, a shoe, your spectator's purse, even another palm). 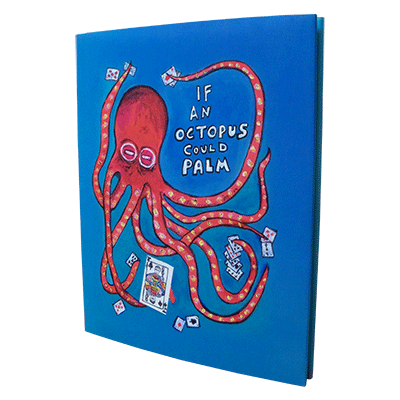 Palming also affords the ability to retain certain cards while the spectators shuffle, only to be replaced later, under your control.Beautifully printed and bound with luxurious features such as a foil embossed title, a tip-in reproduction of the original cover art by Juan Luis BuÃ±uel, a protective dust-jacket and color accents throughout, If an Octopus Could Palm is 90 pages with 109 hand drawn illustrations.